In this workshop we will explore the intricacies of hand-built earthenware vessels. The workshop will cover simple mold making and slab construction, with participants learning to make and use simple bisque molds to create an assortment of utilitarian forms. We will discuss basic design principals and explore how glazing treatments affect the perception of the pot’s form. I will demonstrate how I move from text to decoration, then shape to surface. We will also be masking and layering glazing techniques with low-fire glazes, using a variety of common office supplies to cut resist-style designs. A wide variety of other possibilities for surfaces will also be presented. Activities: Demonstrations, slide lectures, and above all else, supervised work time. Participants will engage in a hands-on experience and receive daily feedback. The workshop is open to artists with all skill levels. Connie Norman is known for her painstakingly and beautifully constructed pottery. Armed with pieces of movable type, she presses each letter individually into the clay. She constructs each piece with a combination of hand-building techniques. Connie’s glazing process continues the meticulous process by cutting out each design from masking tape. Connie’s work has been shown internationally and has been published in Ceramics Monthly, Pottery Making Illustrated, Ceramics Now, 500 Vases, The Best of 500 Ceramics, and Surface, Glaze and Form: Pottery Techniques. Connie is also a Robert Rauschenberg Foundation Fellowship recipient, and she recently received a Wyoming Art Council Visual Art Fellowship. 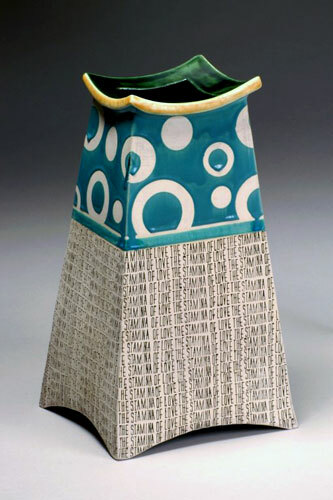 She is a graduate of the New York State College of Ceramics at Alfred University. All my life I have struggled with writing; now my work is completely covered in text. This paradigm shift has allowed me to experiment in different art forms and face fears through the medium of art. It has been an interesting adventure in self-discovery! The text in my pieces acts on several levels. For instance, it has texture, pattern, and mystery, and it provides a path looking inward to decipher a glimpse into my private thoughts. I am fascinated by the rhythmic qualities created by color, texture, and pattern. Decoration and the act of decorating are essential to me because decoration celebrates and enhances form and speaks purely of aesthetics. I use pottery as a vehicle to explore decoration and other formal questions: it allows me to investigate form, space, and image. My greatest satisfaction comes from thoroughly filling surfaces with color and finely detailed decoration in a spirit that I feel is playful and whimsical. My attempt is to make the environment an expressive participant and to address the importance of aesthetics in our daily lives.